March 11, 2019 in General Media Release. 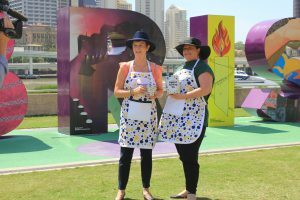 Cancer Council Queensland is calling on Queenslanders to prepare to pop on the kettle and host an Australia’s Biggest Morning Tea their way this May in support of the one in two people who will be diagnosed with cancer in their lifetime. Registrations for the fundraising initiative are now open for 2019 and to raise awareness ahead of the official date, May 23, a giant mug will travel around the state. The first stop on the mug’s tour will occur today and will be the iconic Brisbane sign in Southbank. Cancer Council Queensland CEO Ms Chris McMillan said the charity hoped by sending the mug around the state and showcasing its journey on social media, using the hashtag #MugOnTheMove, more people would learn about the fundraising campaign. “It’s a fun way to let more people know about Australia’s Biggest Morning Tea and encourage Queensland communities to pop on the kettle and host their own event,” Ms McMillan said. Ms McMillan said Queenslanders needn’t wait to see the mug on social media or visit their town to sign up. Our new-look website for 2019 has just gone live, so we’re calling on Queenslanders to register as a host and set a date now, to make a difference,” she said. “One person is diagnosed with cancer every 20 minutes in Queensland – the length of an average morning tea break. “You can help us support those impacted by cancer by getting friends, family or workmates together to share a cuppa and delicious food and donating to the cause. Each year Cancer Council’s Australia’s Biggest Morning Tea is enjoyed by more than a million people nationally, and in 2019, Cancer Council Queensland aims to raise $2.1 million for cancer research, prevention, information and support services. The official date of Cancer Council’s Australia’s Biggest Morning Tea is Thursday, May 23, 2019, but people can register to host an event anytime in May or June. Register now to host an event at biggestmorningtea.com.au, or by calling 1300 65 65 85, and you’ll receive a free host kit with everything you need to make your morning tea a success. To stay up-to-date with where the #MugOnTheMove travels to, follow Cancer Council Queensland on Facebook or Instagram, or have your say on where it should move to by visiting cancerqld.org.au/mugonthemove. For more information on Australia’s Biggest Morning Tea, members of the general public can call 1300 65 65 85.